Jonathan son of King Saul was a courageous and daring officer in his father’s army. In the war against the Philistines, he commanded a third of the Israelite army and performed acts of great valor. Unbeknownst to Jonathan, Saul had forbidden his soldiers to eat. Saul found out that Jonathan had eaten some honey and condemned him to die, but Saul relented when his soldiers pressured him to let Jonathan live. David came to Saul’s court and formed a deep friendship with Jonathan. Saul, who suffered from depression and paranoia, became jealous of David’s successes in battle and ordered Jonathan to kill him. Jonathan warned David of his father’s murderous intentions and told him to hide. Jonathan went to his father and asked him not to harm David, who had done nothing against the king and, on the contrary, risked his life, fighting against the Philistines. Saul listened to Jonathan’s good words about David and agreed that he would not try to kill him or hurt him. This did not last long; soon afterward, while David was playing the harp for him, Saul again attempted to kill David with his spear. The weapon struck the wall; and David fled, first to his house and then to another town. David returned and went to see Jonathan to find out why Saul hated him with such a murderous rage. He arrived the day before a banquet that Saul was giving in honor of the New Moon Festival. David told Jonathan that he would risk attending the king’s banquet and that Jonathan should explain his absence from the celebrations by saying that David had gone to Bethlehem for the yearly family sacrifice. David instructed Jonathan to watch for Saul’s reaction. The two friends agreed that David should go away for three days and then return and hide in a field. Jonathan would come to that place under the pretext of shooting arrows but in truth to inform David, by a prearranged code, whether it was safe to return to the royal court. The next day, at the banquet, the king noticed that David was not there but kept silent, thinking that David had stayed away because he was not ritually clean. Saul became angry and shouted to Jonathan, “You son of a perverse, rebellious woman! I know that you side with the son of Jesse–to your shame, and to the shame of your mother’s nakedness! For as long as the son of Jesse lives on earth, neither you nor your kingship will be secure. Now then, have him brought to me, for he is marked for death (1 Samuel 20:30–31)!” Losing all control, Saul threw his spear at Jonathan to strike him down. Jonathan rose from the table in a rage, because his father had publicly humiliated him. He now realized that the king was determined to kill David and grieved for his friend. Jonathan met David the next day at the appointed place and told him that he should go away. They kissed each other goodbye, and David fled to the priestly town of Nob. 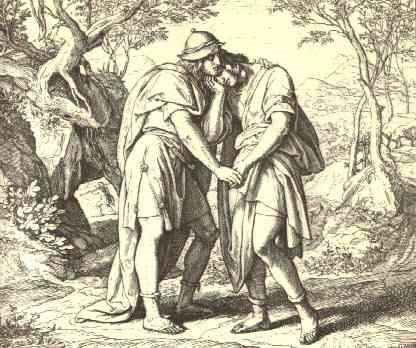 Jonathan and David saw each other one last time when Jonathan went to the wilderness of Ziph to meet David, who had become the chief of an outlaw band. Jonathan told him not to fear, that the hand of Saul would never touch him, and that, one day, David would be king and Jonathan would be second to him. Jonathan fought at the side of his father in a battle against the Philistines near Mount Gilboa. He and his brothers Abidanab and Malchishua died fighting, and Saul committed suicide. Jonathan and Saul were mourned by David in a beautiful elegy. Jonathan was survived by a five-year old son named Mephibosheth, who fell from his nurse’s arms and became lame. Years later, when the boy was grown up, David brought him to the court and, for the sake of Jonathan’s memory, restored to him the lands of his grandfather Saul. Israel's first king was a controversial ruler.